Yeah, why not? 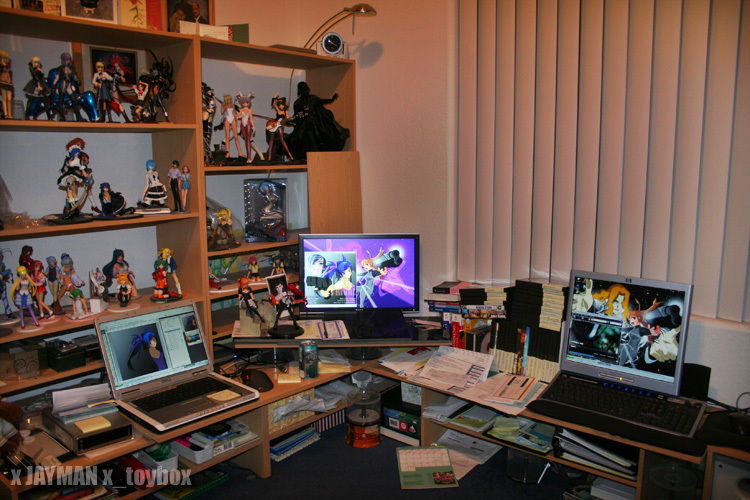 A photo of my *anime*-style workspace at home. Very little attempt to clean up. Just 48 of my 79-figure collection, plus lots of goodies (and bills, argh). My setup: (1) Left. 15-inch laptop. About 2.5 years old. My main machine, hooked up to center monitor. Working on Akiko. (2) Center. 20-inch monitor. To watch anime, movies, and check Photoshop graphics. Akiko on top of Purple Mirai. (3) Right. 17-inch desktop. About 4.5 years old. For BitTorrent and Pandora to free up laptop resources. Shiro Otoko & Mirai. This entry was posted in Anime Figure, Danny Choo, House, Mirai Suenaga. Bookmark the permalink. ← Blog 131 > Mirai’s Tsundere Rival!